Proponents of the SHAME approach contend that students provided a systematic education covering all the SHAME components will be more well-informed human beings, have a deeper appreciation of life and culture, be able to learn independently, have healthier professional and personal relationships, contribute more meaningfully to the lives of others, and have more fulfilling personal lives. SHAME critics argue that these ideals are not the goal of education, especially public education, which exists primarily to prepare students to achieve well on standardized tests so they can qualify for jobs in business and technological fields. 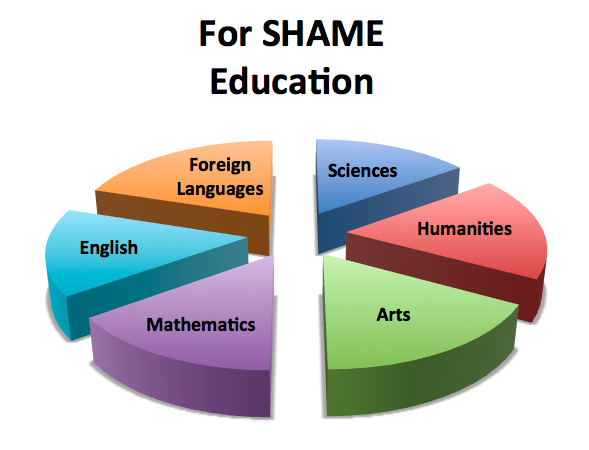 SHAME education uses the term Sciences to denote primarily natural and empirical sciences such as Biology, Chemistry, Geology, and Physics, while the Humanities component describes a wide and diverse array of disciplines including the study of ancient and foreign languages, social or “soft” sciences such as History and Psychology, as well as Literature (also considered crucial under the English component), Philosophy, and other fields depending on the age and interest of the student. The Arts component – the study of Music, as well as Theatre, Dance, and Visual Arts – is considered crucial to a SHAME Education, as is a thorough, sequential Mathematics curriculum and an English curriculum that trains students to read and write critically and imaginatively while introducing them to the great writers and works in the English language and how they have shaped and transformed our culture. A fringe group within the SHAME movement articulates a further development of this curriculum, lifting the study of Foreign Languages out of the Humanities altogether and elevating this pursuit to the level of a sixth component. 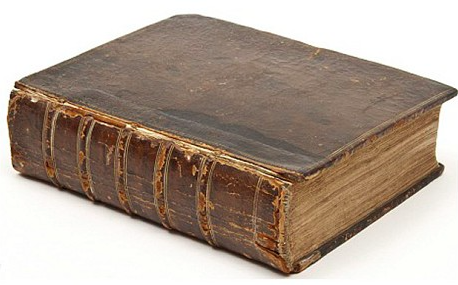 “For SHAME” educators claim that the ability to fluently speak, read, and write in a language other than one’s “mother tongue” is a hallmark of the educated person in virtually every developed nation with the exception of the United States. For SHAME Educators aim to address this issue with an emphasis on Foreign Language acquisition by students beyond the token two years of study currently required by some school districts. Critics of the radical movement are quick to point out that not all the SHAME components are easily assessed by standardized tests and other evaluative measures currently in place, making them less lucrative subject areas for companies like Pearson, McGraw-Hill, and Harcourt. Another shortfall of the curriculum is that it does not place adequate emphasis on “21st century skills” such as making PowerPoint presentations and using cell phones to research topics on Wikipedia – although SHAME educators claim that these and other crucial activities can be worked into the SHAME approach. 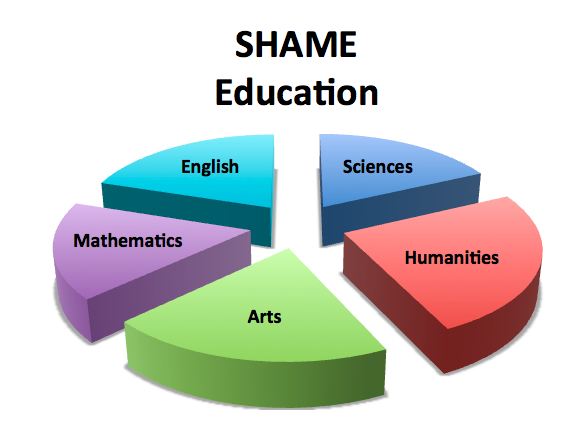 Relevant and effective or not, most educators regard SHAME as yet another unremarkable passing educational fad, although some of the few teachers still in the classroom who joined the profession before No Child Left Behind suspect that SHAME may be a leftover from those dark ages warmed up for the next generation of students. By walterbitner in Education, Music Education, Philosophy on July 20, 2015 . Thanks man! Hope you’re having a terrific summer! many grassroots actions just as they have been gathering a head of steam. Have you considered writing and submitting articles to the TN Musician – TN Music Educators- quarterly magazine? Your advocacy voice would be a good addition. Thanks Margaret – I haven’t yet but I will look into it! It does seem familiar doesn’t it! Thanks! I really needed that today! Next thing you know, these kids will start understanding the natural world, and where will that end up?! !